Rather than tell you about ACTS, we would like to show you ACTS. If you have a webcam, please sure that it is plugged in and active. Turn on the speakers on your computer. To begin the demonstration, click on the image below. Select either SIM Mode or ACT Mode. SIM Mode has no training components. ACT Mode follows the ACT training paradigm - Listening, Analysis, Strategy, Talk. We suggest that you first experience the SIM Mode and then the ACT Mode. The first page of the course is a webcam setup. When the prompt appears, depending on your browser, select "allow" - for the server to activate your webcam. Go to next page. Stop recording. If there is a Help Page, it will appear. If no Help Page, proceed to next page. Redo this page. Your new recording will replace the previous one. Open an attachment. A new page will open. Close page to return to the course. Playback your recording. You may view your recording as many times as you wish. Help Page is available. You can open both the Playback and Help at the same time. Close with Next button. Manual or automatic recording. Click on button to start recording. Stop recording with another click on it. On auto record the webcam has been activated and you are being recorded. Click on it to stop recording. Important Reminder: It is essential that you speak aloud. Do not merely think about your responses. Talk, record, watch your recording, and consult help screens (if provided in the ACT Mode). 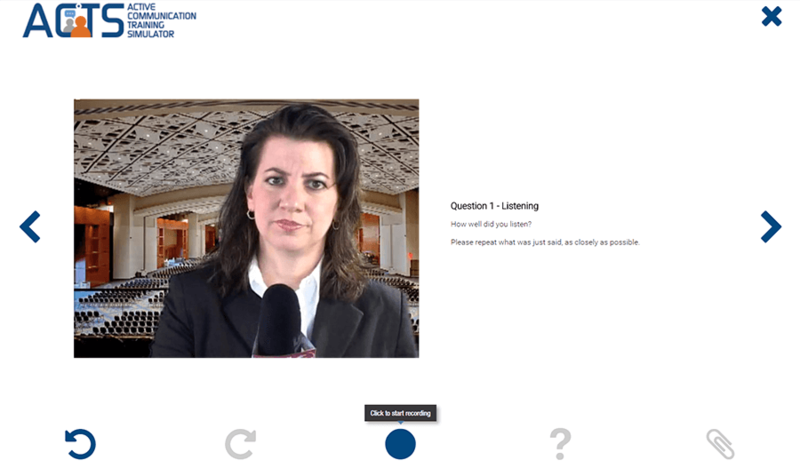 Watch your recording immediately after each response, or you can watch all your responses at the end the course by selecting you can "Review without Saving" at the completion of the course. All your responses will be removed from the server when you close the window. ACTS is based on WebRTC or Flash and, therefore, will not function on an iPad or iPhone. It will work, however, on Apple computers that support Flash. ACTS is available for iPad users, with the iACTS app. This app is only for registered ACTS users and cannot be used for this demonstration.